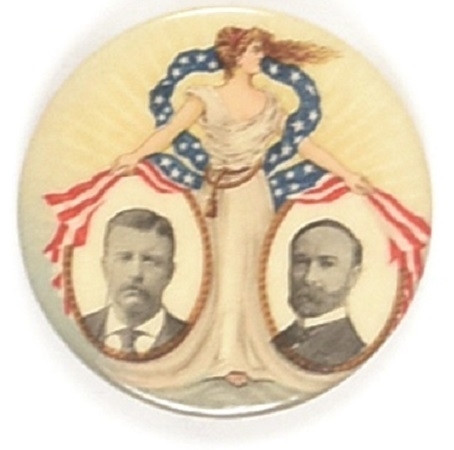 Lady Liberty gives her blessing to Theodore Roosevelt and Charles Fairbanks on this classic celluloid jugate. This is the larger 1 3/4 inch version of this spectacular pin that has retained its vibrant colors. Whitehead and Hoag back paper, excellent condition. We sold this pin previously for $1400 but it has been difficult to sell recently even with very reasonable starting prices. Far tougher than the 2 1/8" version.